From left to right: Peter Baumann, marketing director for LIQUI MOLY; Michael Reinsdorf, owner and president of the Chicago Bulls; and Sebastian Zelger, director of LIQUI MOLY USA. 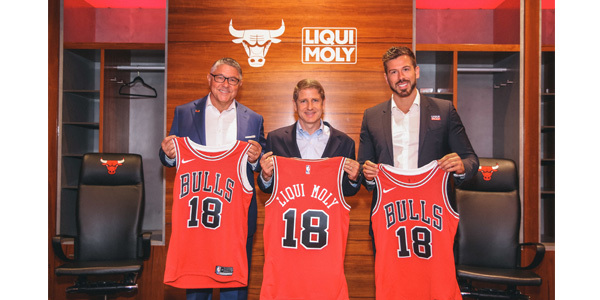 German oil and additive specialist LIQUI MOLY said it has signed a two-year advertising contract with the Chicago Bulls. With ads in the arena and on social media, the company seeks to tap into the broad appeal of the NBA team. The seven-figure ad deal “is our largest-scale sponsorship program ever in North America,” according to Peter Baumann, marketing manager at LIQUI MOLY. The oil manufacturer’s brand will have a significant presence at the United Center, including permanent logo placement on the pole pads of both baskets, as well as on the Bulls’ digital platforms. The ad deal also opens up the opportunity for LIQUI MOLY to entertain customers at the games. “This transatlantic collaboration is not purely an investment in our U.S. trade – its impact goes far beyond the region,” Baumann said. “The NBA is by far the most popular basketball league in the world, with hundreds of millions of spectators following the games worldwide. What is more, the Chicago Bulls have large numbers of particularly loyal fans – not just in North America but also in South America, Europe, Asia and Australia. The club itself claims to have 175 million fans worldwide – more than any other professional team in the USA. Even though LIQUI MOLY has focused its sponsorship on motor racing, the brand is increasingly appearing away from the racetrack. In its home country of Germany, LIQUI MOLY has for years been an exclusive partner to Ratiopharm Ulm, a team that plays in the German national basketball league. And in the United States, LIQUI MOLY now has been involved in ice hockey for a year, sponsoring the Los Angeles Kings of the NHL. 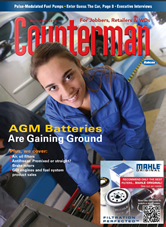 LIQUI MOLY’s U.S. sales are booming. In the first half of 2018, year-over-year sales were up over 40 percent, according to the company. LIQUI MOLY has made massive investments in the U.S. market, more than doubling its personnel there in the last two years.